Visit the 29th Ward office at 4807 W. Harrison St. from 9 a.m. to noon Sept. 8. Light refreshments and snacks will be served at the new satellite office, which is open on Wednesday and Saturday mornings. Join state Rep. La Shawn Ford and several Boy and Girl Scout troops from 5 to 6 p.m. June 28 at 5601 W. Corcoran. There will be free food and music. Third Unitarian Church awarded $14,000 to 14 students. This is the 40th year the congregation has given the awards. Local resident Renna Thomas issues a challenge to West Side ministers and people of faith. 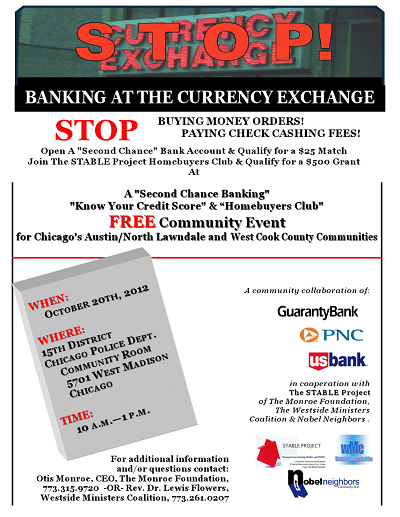 The free session will be held from 10 a.m. to 1 p.m. Oct. 20 in the 15th District Chicago Police Department community room, 5701 W. Madison Ave. Residents of Austin’s Central Plaza Residential Care attended the Sept. 29 reception and prayer service for individuals with mental illness at St. Catherine of Siena-St. Lucy Church.